Cummingston – in the sun, the Moray coast – an easy day after a heavy night. 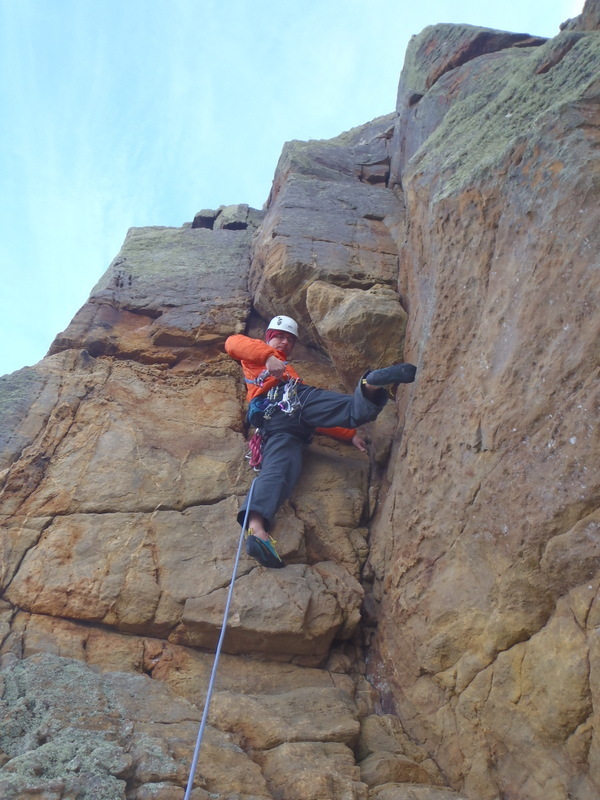 Cummingston in the sun on the Moray Coast.The cliffs were very quite Pete Greening climbing. “Left” I was not so relaxed! 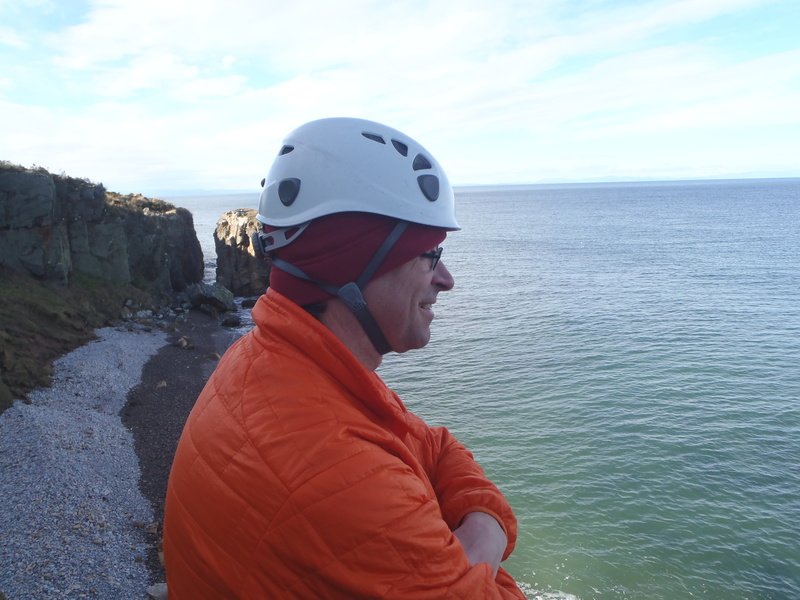 It was planned to be a wander over to the Portsoy sea cliffs today but we had an unplanned night in Burghead with an old friend so in the end we walked to our local crag at Cummingston. It is a short 15 minute walk from the house, how lucky am I along the Moray Coastal path which so many enjoy. The views were outstanding yesterday with Morven standing proud across the coast and as always a great sight. The sun had brought lots of people out enjoying the views and the fresh air, lots of kids, dogs and families having a wander and looking at the new well that has been opened up at the start of the walk from Burghead. It is a real meeting place now St Aethan”s Well, which is located in a field behind the Maltings at the other end of Burghead in land owned by Strathdee Properties! The well is used to be known as the Roman Well, but is now thought to have Pictish origins. St Aethan”s Well which was reopened to the public recently (11th February 2014) is in farmland having been filled in by the farmer to prevent his cows falling into it. It was rediscovered by the Burghead Headland Trust last year and has now been furnished with a cup on a chain for the public to drink from and two public benches have been added for the public”s convenience. Pete trying daring deeds! At Cummingston, the sandstone can be a bit friable and care has to be taken. This is Prophet a crag classic route. Cummingston crags was quite with only one other climber there and we had a few hours of fun in the sun. The tide was in when we arrived (well done Pete) so we went to the Prophet Walls and just kept our feet dry. Pete was climbing well and though he had a heavy night you would never have noticed, I was the usual awful but it was great fun and the place to be that afternoon. This is a place that many miss on the Moray Coastal walk and the small cliffs. sea stacks and caves have provided fun for many over the years for all ages, for those of who are aware of it. It is a great place to take kids and in the summer Dolphin watch and of course climb all with great views. The is little better in life than completing a climb and getting to the top, seeing the Dolphins in the Firth and sitting and enjoying the views. It is incredible that 50 miles away people are skiing and winter climbing in the Cairngorms, life is so varied on the Moray Coast. The gulls are nesting just now but not near our cliffs and you have to watch with some of the climbing protection takes care to place for the inexperienced. The sandstone rock is very friable in places and care must be taken. Pete relaxing after the hauling session with me. Looking to the Moray Firth. We wandered back along the path and I stopped and enjoyed the views the sun was still shinning yet the air was getting colder. There were still lots of people about and you had to dodge the kids on Scooters but great to see them out away from the TV and computers games. How many have such a place on their doorstep yet never appreciate what they have and it costs so nothing to take a walk in the fresh air ? I cannot wait to show this magic place to my granddaughters. This entry was posted in Enviroment, Family, Friends, Local area and events to see, mountain safety, Rock Climbing, Wildlife. Bookmark the permalink. 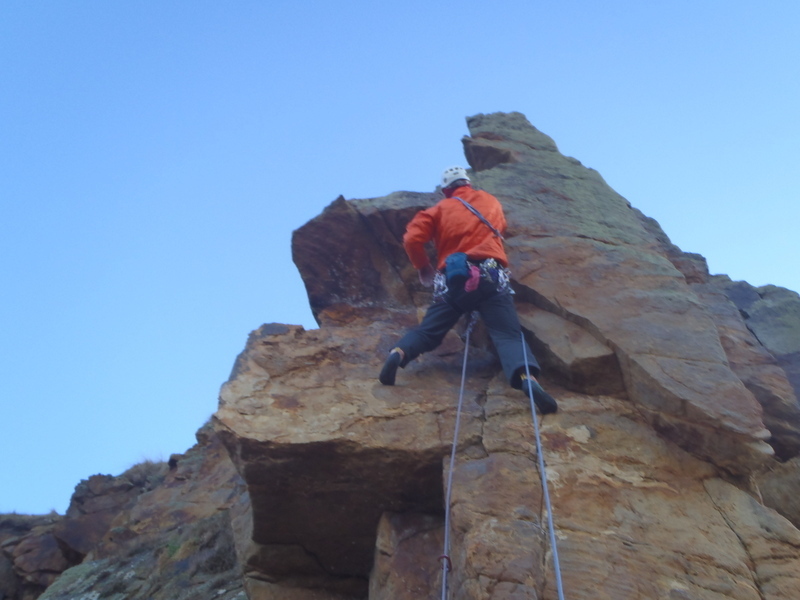 4 Responses to Cummingston – in the sun, the Moray coast – an easy day after a heavy night. I must have ran past you guys yesterday afternoon. Was great weather and nice to see the sun out. Noticed that they had reopened the new well, good to see. The new surface on the path to cummingston seems to encourage more families along that way. Shame they didnt bother with the bit by the malting. Yes it is a magic place – good news on the pending new arrival! It was a great day – lucky us living in Moray!